Here’s the deal: fish oil is a hot topic these days. Most conventional medical authorities tout fish oil as a cure-all for every ailment, from chronic pain and fatigue to neurological disorders! Others argue that supplementing with it isn’t natural, and we actually require more Omega-6 than Omega-3. Before we get into the specifics on fish oil, we need a little background. Let’s start with the basics on fatty acids. There are three types of fat: saturated, monounsaturated, and polyunsaturated. All fats & oils contain some combination of those types. We NEED all three types in order to be able to inflame and also anti-inflame (both are important!). Where do fish oils come iNTO THE PICTURE? Within polyunsaturated fats, there are two “essential fatty acids”- essential just means your body can’t make them! They are omega 6 AKA linoleic acid (from vegetable & seed oils) and omega 3 AKA alpha-linolenic acid (from fish oils, flax, walnut, & hemp). Fatty fish & their oils, along with flax, walnut, and hemp, provide ALA which converts into DHA & EPA- a critical part of the anti-inflammatory process. Fish oil is definitely anti-inflammatory. But just because some is good doesn’t mean a ton is beneficial! Inflammation is NOT the enemy- it’s when inflammation occurs unchecked and our body can’t stop the process (aka chronic inflammation!) that it’s a bad thing. hink about when you take a steroid- it tamps down the immune response. That’s exactly what too much fish oil can do. If you’ve ever heard me speak about fats, you know that fatty acids are a critical part of our cell membranes (membranes help your body to regulate letting nutrients into your cells and releasing toxins). Because of this, you literally ARE what you eat- especially the fats you eat. Omega-3s are liquid at body temperature, while saturated fats are semi-solid. If you overdo the omega-3s, your cell membranes will become less solid- weak and floppy. Too many Omega-3s can mess up your cell membranes and your inflammatory process- no bueno! 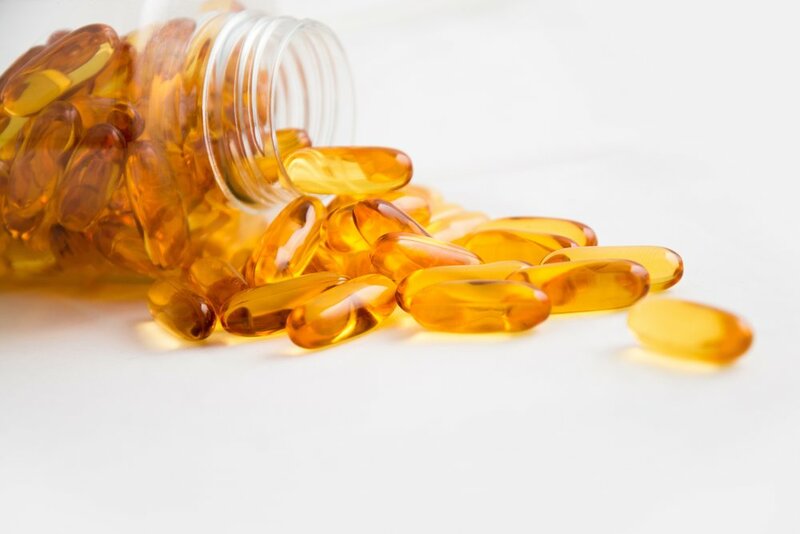 Is fish oil right for you? I personally cycle my fish oil. I cycle according to my own needs (when I’m more inflamed, sick, etc.) with different brands and then stop altogether at some points (especially when I’m eating plenty of whole-food sources of EPA/DHA. Fish oil can be beneficial in certain cases- most notably short term! Those with neurological disorders, in an active autoimmune flare, high triglycerides, or a state of severe acute inflammation can benefit. What we really worry about with fish oil is high doses for prolonged periods of time (think 8+ capsules daily over 3-4 months). You can take a small daily maintenance dose if you prefer, but I think it’s best to incorporate 2 servings of seafood into the diet per week. When you need it, pop in some fish oil every once in a while. Think about it- our ancestors didn’t have access to the same dose of Omega-3s every single day! They would eat it in naturally occurring sources like wild caught fish or grass-fed animals. .
Be conservative in your dosing- your body will thank you! There are the brands I love! Quality is super, super important for fish oil. Fish oil is a fragile fat, so you need to make sure it is cold-processed and from deep-water fish. You want the bottle to be opaque (preferably dark as well) to protect the fish oil from becoming rancid. Little nutrition side note! When you’re taking cod liver oil, always pair it with a grassfed ghee or butter (which you can actually get in supplement form as well!). Vitamin A from the Cod liver oil is synergistic with vitamin K from the butter (aka they ‘re both absorbed better when consumed together!). Did this clear up some fish oil confusion for you? Let me know your thoughts in a comment below! !